The local elections are being held this Thursday, where people across England and Northern Ireland will decide who runs their council. 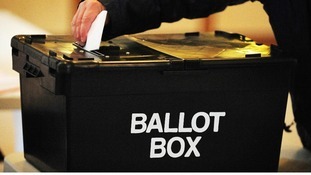 Elections will be held in 161 councils across England and 11 in Northern Ireland on Thursday 22 May - the same day as the European election. Last year the turnout for the local elections was 31.3%. The turnout figure has rarely risen above 40% in the last 20 years with the exception of General Election years, when it usually rockets above 60%. There are 4,232 seats up for election and Ukip are set to put forward 2,150 candidates - a record number for the party. Results in England's local elections are expected from 10pm on Thursday 22 May. The local elections in Northern Ireland will have a different feel to them this year with the country currently undergoing a local government reform. The country is reducing its amount of districts from 26 to 12 - with 11 of the new districts set to hold a vote. All seats are up in the new Northern Irish district councils of Antrim and Newtowabbey, Armagh City, Banbridge and Craigavon, Belfast City, Causeway Coast and Glens, Derry City and Strabane, Fermanagh and Omagh, Lisburn City and Castlereagh, Mid and East Antrim, Mid Ulster, Newry City, Mourne and Down and North Downs and Ards. Northern Ireland's local elections results are expected from Friday 23 May. Every seat in all of London's 32 boroughs are up for grabs marking a key day in shaping local government within the capital. Over 1,800 seats are available in the capital and Labour will be targetting Tory-held councils in outer London areas. Labour will be hoping to take control of councils including Barnet, Croydon and possibly even Hammersmith and Fulham. It is the first time that every council seat in London has been up for grabs since the 2010 General Election. Only a third of seats are available in most English councils meaning that the prospect of a dramatic change of the local government landscape is unlikely. However, there are a couple of councils that could be there for the taking. There are three councils where all of the seats are available - Milton Keynes, Slough and Three Rivers. All three major political parties have controlled Milton Keynes in recent years, which means that council could be up for grabs. Slough is likely to remain Labour, while the Lib Dems should secure Three Rivers. Bradford council could also be available with Labour and Ukip both in with a chance of taking full control there. The local and European elections will be held on May 22 but five mayoral elections will also take place that day. Residents of Hackney, Lewisham, Newham, Tower Hamlets and Watford will all be able to vote for who they want as their mayor. Controversial independent mayor Lutfur Rahman is seeking re-election in Tower Hamlets, while Liberal Democrat Dorothy Thornhill is battling to remain in her position in Watford. The mayors of Hackney, Lewisham and Newham are all Labour and seeking their fourth consecutive term. For more information on the local elections 2014 go to About My Vote's website or The Electoral Commission.